The scene near sunset as we gather to celebrate The Radiant One. Photo copyright 2010 by Randolph Fritz. It has taken me a week to be able to even write this little bit about the festival. Tired, crazy, processing. But here’s the quick summary: wonderful. The weather—at the Oregon Coast, I might add; never known for its sunshine, even at the Solstice—was beautiful. Clouds Thursday, more sun Friday, mostly sun Saturday, full sun Sunday. The people, hundreds of them, were also beautiful. So much warmth, so much sincerity, so much kindness and love. The magic was powerful, deep—but not overwhelming. Because She’s like that. As you see in the photo above, the temple aligned with the Sun Gate, aligned with the obelisk…and what you can’t see here are the four quarter obelisks. You’re actually seeing the back of the temple here. Between the wings was a golden throne…not sure why it isn’t showing up in the photo. Magic, perhaps? The Temple of Isis and lotus pool in the daytime. Photo copyright 2010 by Sander Feinberg. 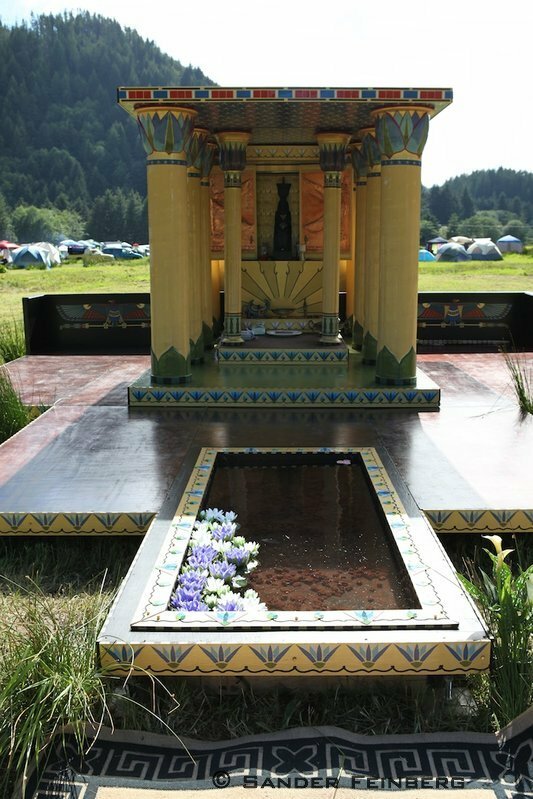 The Temple of Isis at night, floating candles in the lotus pool. Photo copyright 2010 by Sander Feinberg. 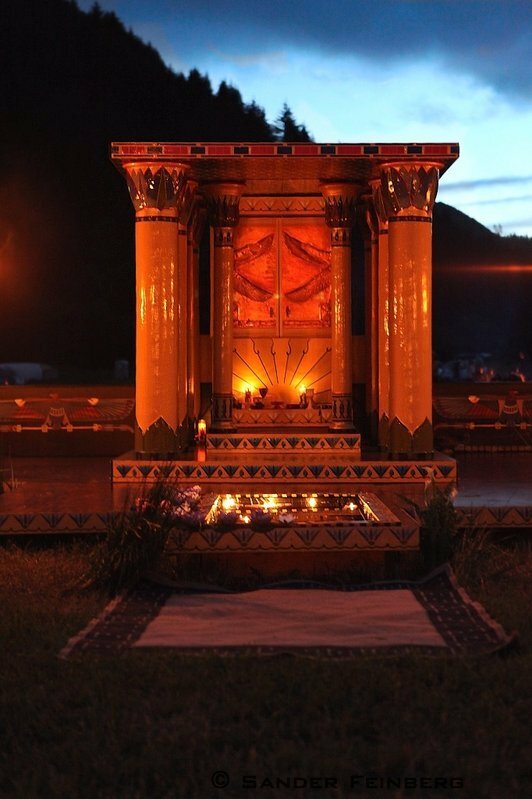 The Sun Gate and dancing fire. Photo copyright 2010 by Sander Feinberg. I have a number of favorite memories of the festival, but I think my absolute favorite is this one: a mother reported that her little girl of about four years old had giggled all through the night, which was unusual for her. Mom asked her what she was giggling about and the girl told her mother that she had dreamed of Isis, that She had wrapped her in Her wings and told her how much she was loved. And I had other tales of other friends who had awakened with laughter on their lips. What more could we ask than this joy? There were healings and tears and gratitude. And more laughter. 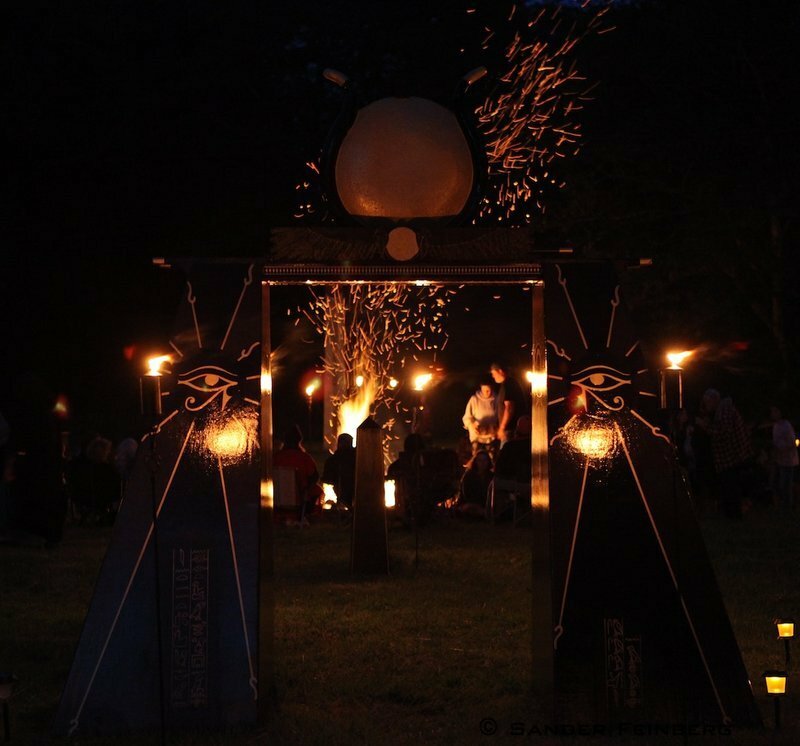 We were indeed blessed by the Goddess, and I personally have been blessed by all of you who participated—from the ritualists to the temple builders to our hosts and hostesses of OWOW to all who make the journey to join us for this most beautiful celebration of Isis the Radiant Goddess. Next Next post: What’s to Become of Isiopolis? I know where and why the throne was not… between Her Wings, no… but look closer, look closely, and you will see the throne draped with fuzzy lamblike wool, as the throne was in the center of the great space, before the great gate and great obelsik, facing the shrine, facing the Goddess -Isis! Just as i was unable to hold space for any but Her Radiant Self it were all the strength i had, and yet ther, She held space for me, as all the strength of the community that not only embraced Isis this Sunfest, but as many of them also embraced and held me up! At once i had so longed for this moment in time, nearly at held breath! Pinching myself all the while to recall that i was awake! And this, not that kind of dream! It all were as though i could not live until i had seen these days, this work, unfold. And wanted not to miss one single word. But yet, was barely able to stand, let alone attend a rite or ritual at all, save for the few words that were my responsibility. No, i was literally physically ill, and unable to attend to the people, to the city, Memphis, under my care, to the temple with the Priesthood, my sisters and brothers in Isis. What great mystery was i to learn from this sickness that kept me from my hearts great desire? A deep long time ingrained pattern for wanting to give, wanting to share and wanting to be inclusive, because i am cut from a unique and different bolt of cloth and from a unique and different land with unique and different cultural patterns. One person said, to me, that they wished to make for me a magic boomerang, so that the i could recieve back all the good that i give out to the world. Just for a little while i had it in me to be, to share and to give. And i am thankful for that opportunity. It shall not come again. it was, once in a lifetime. But, yes, i was there. I offered and accepted. The throne, and the embrace were for me, even if only for that one breif moment. And yes, i did my lowest best in that highest moment in time. And all the Gods were watching! If it were a test, i passed. If it were a lesson, i learned. And cannot imagine what awaits for me next…..
Ah yes! Of course….I remember now.